In comparison with most other Irish counties, Mayo has fewer records of value to family historians. This makes it important to use the existing records to their best advantage. The main Mayo families include Walsh, Gallagher, Kelly, O’Malley, Moran, MacHale, Gibbons, Joyce, Connor, Conway, Higgins, Murphy, Burke, Bourke, Reilly or Riley, Durkan or Durkin, Doherty, McHugh, MacHugh, Sweeney, Sweeny and Lyons. 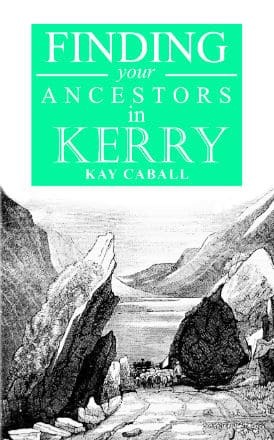 This book sets out the records available, where they can be accessed, and how they can be used to best effect in tracing Mayo families. Mayo does not have a rich store of records, therefore it is essential to glean the most from the sources available – and this book will tell you exactly how to do this. Beginning with a brief reminder of research principles, resources are examined chapter by chapter … with suggested further reading and useful addresses also listed. 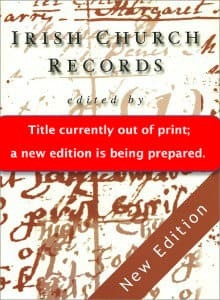 The author has captured the essence of Irish research and tells the reader how best to find and research the records, the purpose for which the records were originally created and what information you can expect to find….